Purchased at the 1953 exhibition by the present owner's mother, and by descent. London, Redfern Gallery, Adrian Ryan, Paul Feiler, Frederick Gore, Hilde Stieler, January - February 1953, no. 78. Feiler's first exhibition at the Redfern Gallery in 1953, which included the present work, was a sell-out. The proceeds of the show enabled the artist to acquire the disused chapel at Kerris, near Paul, where he still lives with his wife, the painter Catharine Armitage. His work has consistently been concerned with structure and space and the challenge of rendering his environment in pictorial terms. From his upbringing in Germany and childhood holidays in the Alps to the light and landscape of Cornwall, it is his surroundings which continue to inspire and motivate his work. Feiler studied at the Slade School of Art where his fellow students included the painters Patrick Heron, Adrian Heath and Bryan Wynter and the sculptor Kenneth Armitage. On arrival in Cornwall in the early 1950s his work was associated with the post-war Modernists in St Ives. His paintings from this decade were influenced by Abstract Expressionism but it was an abstraction drawn on external, natural sources and the paintings themselves are studies in dichotomy - light and shadow, space and solid forms, geometric shapes against organic forms. 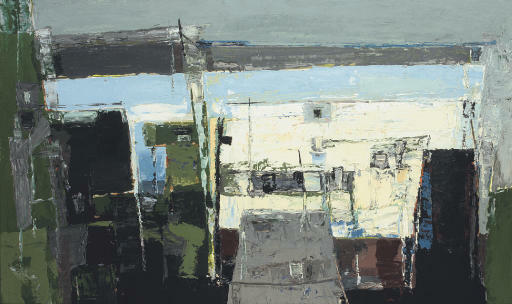 The surface of the paint itself becomes part of this duality; applied in layers with a palette knife in broad, thick impastoed blocks which emphasise the rich tonal palette of creams and whites, slate greys and sky blues, all somehow particularly redolent of Cornwall, yet spiced with brilliant flashes of orange and green. Priest's Cove is located on Cape Cornwall, one of the most westerly parts of Cornwall, the tiny fishing cove dominated by the bulking cliffs of the Cape.